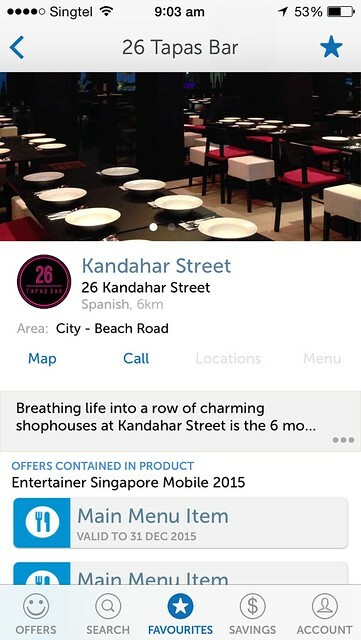 Quite a few of my friends are happily using the Entertainer 2015 app, which gives you 1-for-1 deals at over 250 merchants in Singapore (see full list here). Dining, spa, travel and leisure activities - imagine halving your costs for these! If you go out a few times or have a big group of friends, you can already start seeing savings from the first month! In fact, here are 10 of the best (IMHO) tapas/small plates and drinks spots you can hit with the Entertainer, along with the estimated savings. There are 3 vouchers per merchant; you can use them throughout the year singly or stack up to 4 vouchers at the same time for up to 8 people or more when you combine vouchers with a friend. &SONS has many things going for it - a cocktail and wine bar, salami bar, cheese room and Italian kitchen. They aim to replicate the feel of Venice's bacaros with the convivial environment, artisanal Italian small plates and sleek cocktails. 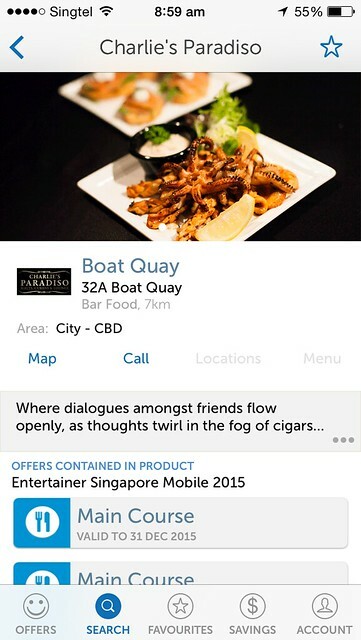 Redeem two small plates (about S$29). 26 Tapas Bar dishes out an East meets West twist to Spanish cuisine. Besides the small plates, there are also thin-crust pizza and pasta choices which you can pair with Archipelago draught beers. Redeem main menu item (about S$19). B-Bar at Bacchanalia is a contemporary bar housed in an old landmark building. Similarly the team blends both old world and new with their take on forgotten classics. Food is also a key part of the experience. Redeem main menu item (about S$24). Bitters & Love is a specialty cocktail bar tucked behind Shoebox Canteen. Bar snacks include tender Rangers Valley wagyu and triple cooked handcut truffle potatoes. Redeem main menu item (about S$19). Charlie's Paradiso has an extensive list of whiskey and cigars. It offers varied tapas as well as the raved about BBQ Glazed Ribs. Spoon into their lounge sofas and let the sensory indulgence begin. Redeem main course (about S$29). Charlie's Tapas Grill and Bar fuses Latin and Spanish flavours in its tapas and sangrias, right by the Singapore River. Try the signature Baby Back Pork Ribs along with a margarita. Redeem main course (about S$19). 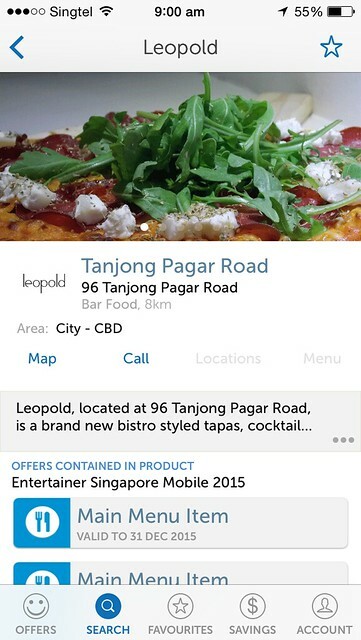 Leopold is a brand new tapas, cocktail and wine bar that's styled like a bistro. The 35-seater owned by Austrian mixologist and chef Klaus Leopold offers European finger food, daily man course specials, German beer, Austrian snacks and drinks, house cocktails and wines from all over. Redeem main menu item (aout S$15). The Mad Men is THE place to hang out after work. There's always stellar live music along with the savoury bar tapas and well-priced drinks. 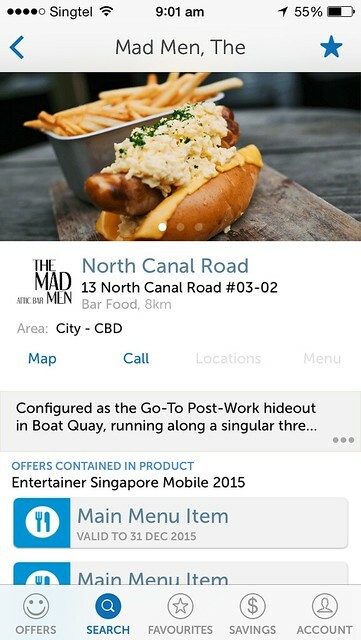 The bar is fun, modern and industrialist in design, and has a great view of the Marina Bay skyline. Redeem main menu item (about S$19). 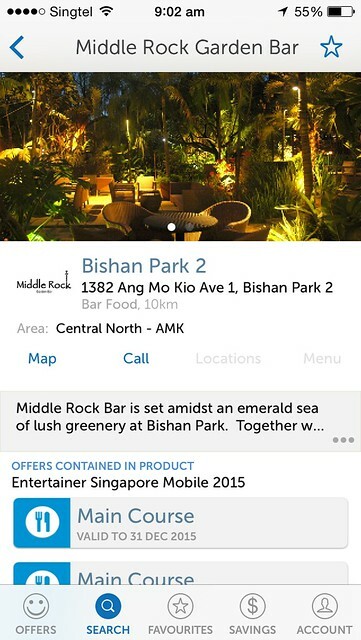 Middle Rock Garden Bar at Bishan Park is a lush oasis away from the concrete jungle. Relax with selected fine wines and signature tapas. Redeem main course (about S$19). 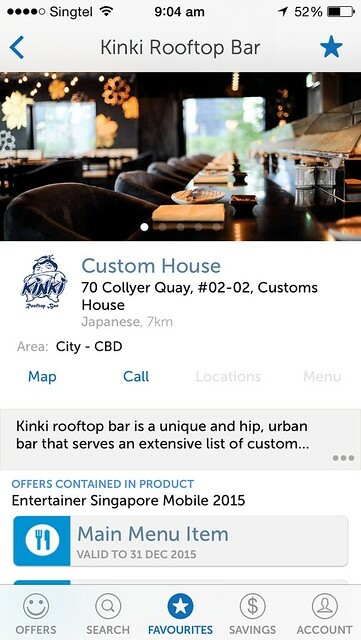 If you're hankering for Japanese fare, check out Kinki Rooftop Bar. You'll love the custom made cocktails made with fresh and premium ingredients from Japan, and the well-stocked bar of Japanese spirits and international selections. The edgy graffiti and urban artwork is a great backdrop for the house and acid jazz. Redeem main menu item (about S$19). 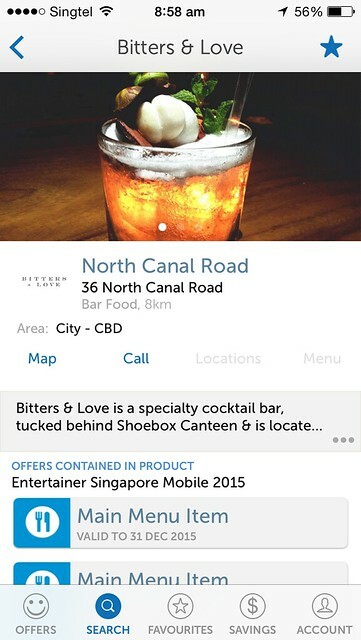 There are so many others - nearly 30 bars alone in the app - KPO Cafe Bar, Skyve Wine Bistro, The Jolly Roger, Squires and Scoundrels, The Wallich, Mariko's, Fern & Kiwi Bar, and so on. 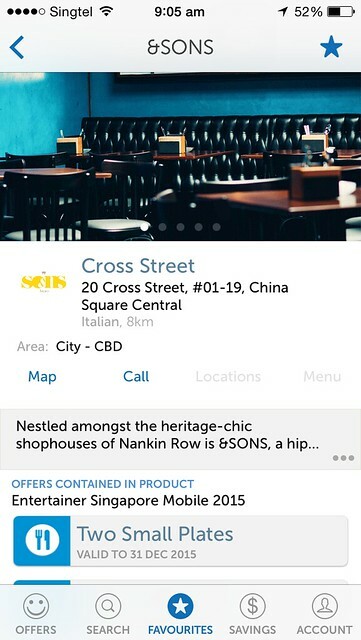 Download the app and have a look around. 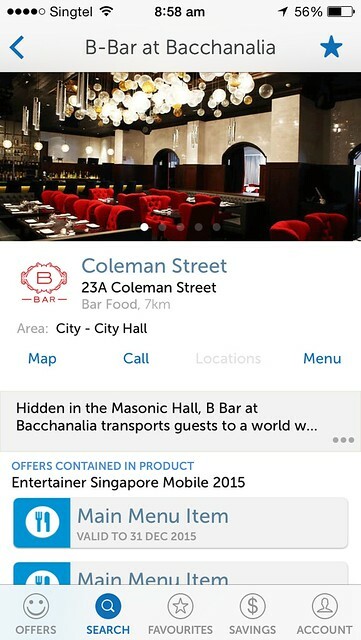 You can also search for your favourite cuisine, area, mall or hotel. 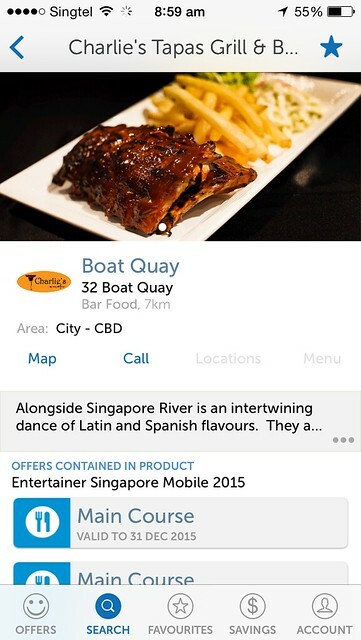 The Entertainer Singapore app is available on iOS, Android, WinPhone, Samsung and Blackberry platforms. Start saving today! Remember to use my code 2015CAM to get 10% off! This post is brought to you by the Entertainer.